I have the opposite problem, my purls are much looser than my knits,creating a very odd tension, I get gauge, but it looks so uneven. 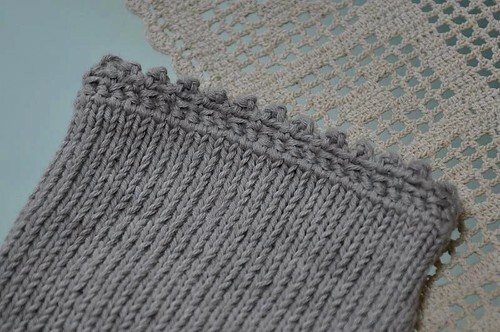 I’ve gotten better success by purling with a smaller needle and knitting with the regular needle, easier to do on straights, and more difficult to do on circulars. Would it help if you did the opposite? It looks wonderful in the photos, isn’t it funny that we are our worst critics? Can’t wait to see the finished result as I have this in my queue and I love the color you’ve chosen. That cotton is lovely – and I’ve found in the past that uneven stitches sometimes even up once it’s been thrown in the washing machine. Although cotton does tend to be more “sticky” in that way, so maybe it wouldn’t have sorted it out. I *love* Felted Tweed. And the colour you have chosen is just gorgeous. Looking forward to seeing the finished item! It happens. Although, you certainly ARE your worst critic. I can’t even find a flaw in your sweater! Would blocking it help at all? I think you are too hard on yourself too!! I think the uneven-ness (not that I could really see it at all!) is part of the “organic” nature of the yarn and the garment, but in the end you need to be happy with it, or else you probably won’t wear it. I do love it in the green though, such a great colour! A good soak and block helps, just in case you want to finish that. But it really depends on the yarn. I just swapped yarns on a project because it was so uneven in the first yarn, so I know what you mean! I looked and couldn’t see the unevenness, but if you saw and would be bothered by it then that is all that matters. The green is such a lovely colour, the flecks will make it more forgiving of uneven tension if it occurs second time round. Can’t wait to see the finished item! Anyway, the felted tweed is simply divine – looking forward to seeing your progress with that. And to see what you end up doing with your cotton. it really is simply stunning stuff. I’m another knitter with uneven tension b/t knit and purl stitches. My purls are looser— so much so, that sometimes my stockinette doesn’t look at all like stockinette on the right side. Your difference in tension seems inperceptible to me. lovely both, but that green is so wonderful! Cotton is definitely much less forgiving – though I think I am much more forgiving on my knitting skills than you! My current knit Francis in a silk/cotton blend knit at a loose gauge has lots of unevenness – like Rose Red I’m going for this being organic! Ah, Felted Tweed, how we love thee…. I think it looks just fine. 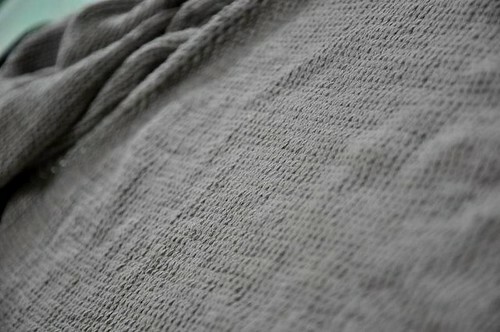 In fact, it looks really nice and that is a lovely soft grey yarn. wow, I really struggled to see the problem! but you will be the wearer so you must be happy with what you do. And anyway, the FT is gorgeous too. If a yarn isn’t doing it for you, I’m all for ripping it out – I love the color on both, but the felted tweed looks beautiful. like someothers I couldn’t really see a problem, and I am sure it would have been lovely – but you do have to be happy with it don’t you? I don’t like cotton for just that reason, and if I’m going to knit in cotton, I prefer cotton with some (heresy!) acrylic in it. It just makes the cotton behave better. I also have different tension knit and purl. am just considering unraveling the shawl collar of my sleevles cardigan…. not sure about it. 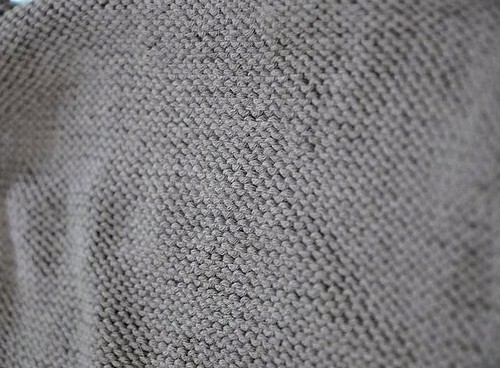 I love wearing store bought cotton sweaters but when I tried knitting one – it was a pain! I also spent a lot of time shifting stitches since the cotton is so unforgiving. Both projects you have there are lovely! Ah, the siren call of the inappropriate yarn. I’ve succumbed to it a time or two myself. 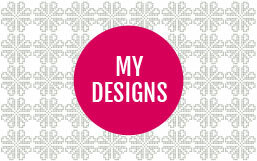 So sorry about your design pains! If you don’t think you like how it looks now, better to rip it – it will drive you crazin in the long run! Love the felted tweed – what a gorgeous color! 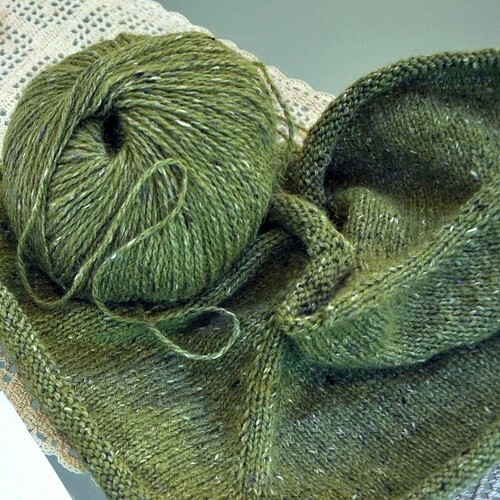 I pefer knitting in wool to cotton as you can tweak it by blocking so easily. I love that green anyway so that is better!